Not too long ago, dome cameras were huge, fitting a full-size box camera into a large protective bubble. The move to "minidomes" changed that, cutting their size in half or smaller. Now, the definition of "mini" has changed again, with even smaller domes available, and manufacturers seemingly in a race to see who can build the world's smallest dome. In this note, we look at the pros and cons of full size domes vs this new generation of minidomes, concluding with our recommendations on when to use each. Wider lens selection: Full size domes generally provide more lens options than smaller domes, in some cases using CS-mounts. Varifocal lenses are commonly available, an option rarely found in minidomes. More features available: Features are available in full size domes which are not often found in minidomes, such as true day/night functionality, wide dynamic range, digital I/O, and audio. Lower F-stop: The larger form factor allows for bigger lenses that can take in more light. While full size domes routinely have F numbers less than 1.6, minidomes often have F number over 2.4 - a big difference in low light performance (see F-stop tutorial for more). Outdoor ratings: Full size domes are generally available in IP66-rated outdoor versions, in some cases with heaters and blowers. Many minidomes are not outdoor-rated, or carry lesser IP ratings. The main drawback to using full size domes is their size. For some users, this may create aesthetic issues, as they prefer not to have a large dome mounted on the ceiling. Recess kits are available, which place everything but the dome itself above the ceiling, but these add cost and require additional installation. Full size domes vary widely in cost, depending on feature set. Basic domes may cost $400 or less, with more advanced models with better low light and WDR performance over $1,000. Smaller than full size domes, minidomes typically are 3-4" in diameter, with 1-2" domes. They are a relatively recent development compared to larger domes, becoming widely available in the past 1-2 years. Because of their size, they are generally considered to be more aesthetically pleasing, without the need to recess the camera in the ceiling. They are also typically quicker to install, since they are, with a few exceptions, lightweight and intended for surface mounting, requiring less installation labor. Limited lens selection: In most cases, minidomes are available only in fixed lens versions, typically wide views. In some cases, optional lenses (often M12 mount) may be used, but very few varifocal options are available. The IQinVision Alliance-mini is one of few domes in this size available with varifocal lens. Lack of advanced features: Minidomes typically sacrifice features such as true day/night, wide dynamic range, or I/O, due to their size. Most minidomes use electrical day/night instead of a mechanical cut filter, which provides lower quality images at night. 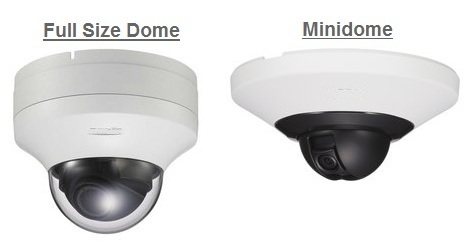 Because of their smaller size and typically reduced functionality, minidomes generally cost much less than full size domes, in the range of $200-300 USD. Minidomes are far more frequently selected than full size domes, driven by lower cost and more preferable aesthetics. However, sometimes advanced functionality only found in full size domes are needed. When deciding between these two, a key factor will be advanced imaging requirements - both for low light and WDR. Most minidomes are color only, with poorer low light imaging compared to a true day/night full size dome using a mechanical cut filter and larger diamater lens. Likewise, minidomes typically do not include WDR to keep cost low and size minimal. Lens selection is likely the second deciding factor when choosing dome form factor. Since the majority of minidomes include fixed focal length wide angle lenses, they may not be appropriate where a narrower view of an area is needed. Full size domes may be more appropriate in these cases, due to the wider lens selection, with some manufacturers offering multiple models of these domes with differing varifocal ranges. If these two issues are not a factor, the combination of improved aesthetics and often far lower cost make minidomes a more attractive options.